The first eight China ink paintings are based on photographs from the nineteenth and twentieth centuries. These finely rendered works bring to life scenes of historical value and social reality in the Charlevoix region, renowned for its picturesque landscape. 150 fascinating original prints and one-of-a-kind drawings. 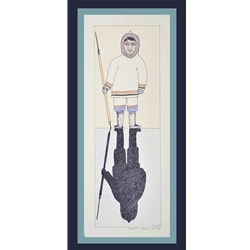 Trace the development of this art form, from the early creative days in the Cape Dorset print shop until today. 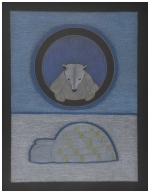 Admire the natural artistry of the nomadic Inuit people - who transferred their ingenious survival skills to a sincere creativity on paper. Be touched pleasantly and surprisingly by the individuality, imagination, freedom of expression and joy of life that are felt throughout these works. "I will tell about the time of my birth. I remember trying to get out towards the light... Listening to the wild birds while fishing is just beautiful. It's a wonderful feeling to start leaving camp to go fishing, and I think that all Inuit feel that way." "As I would visit with her, she made a lot of different drawings as well as carvings. I would always be amazed at her abilities as I watched... would enjoy going over to Pitseolak's." "When I started drawing... if I heard somebody coming into my tent, I would just put my drawings away, because I was shy.... When I heard that people like my drawings, I can really feel it inside me -- it pleases me." "I was born in 1938. My first recollections are of the time we left our camp and went to Nettilling Lake... Even though it was very hard when we grew up, I am glad to be alive, glad that my mother (Pitseolak Ashooona) brought me up. I want to thank the Inuit who help those in need with food, without charging for it. They do these things, but we have heard that is not the way it is in the South. 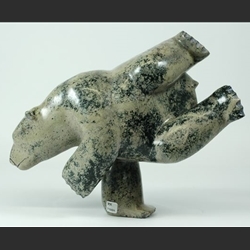 The southern people in our community today are helping the Inuit by having them make carvings and drawings."